This gingerbread house just won a blue ribbon in the Gingerbread Festival at Thanksgiving Point. Could you die?... I don't think I've ever seen such an amazing work in gingerbread (click on the image to see the picture full-size). 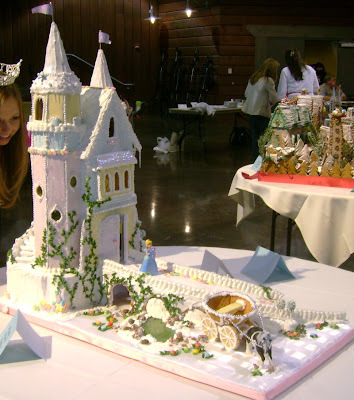 Lisa Greenhalgh has over 20 years experience in designing and building gingerbread houses. We are happy to feature her amazing talents as part of the show this Christmas. 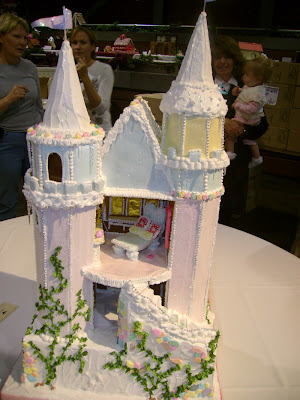 She will be making houses that are just a little bit smaller than this scrumptious castle, although she will make special orders... Each house she makes has a different theme, from the fun 'Polka-Dot Place' to the 'Chocolate Manor' there is one that will tickle your fancy. They smell delicious and will charm young and old alike. It's a Christmas tradition your family will love...and they make wonderful gifts!